The Hualien factory of the Taiwan Fertilizer Company used cypress wood and traditional joinery techniques to repair two groups of wooden buildings badly damaged by typhoons. 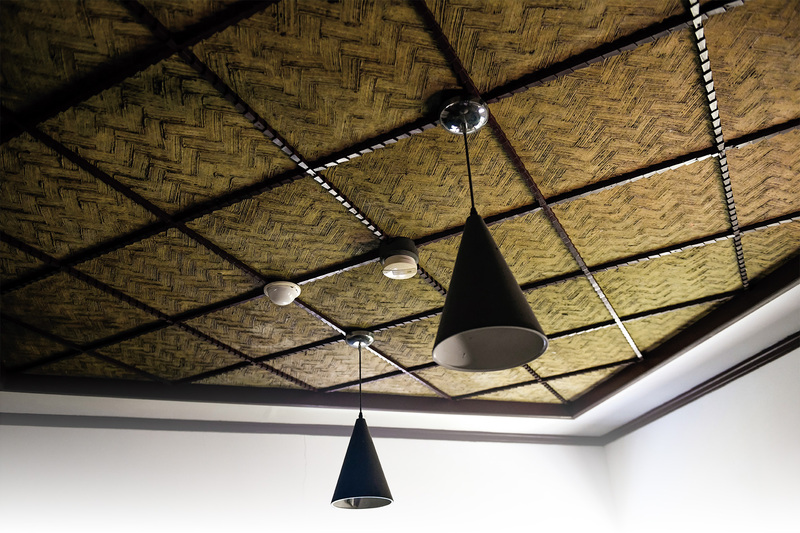 This ceiling in the Kuo Tzu-chiu Music Culture Hall was constructed by first making a layer of roller-crushed sugarcane stems, then applying a thick coating of lime, and finally handcrafting the herringbone pattern with a brush. 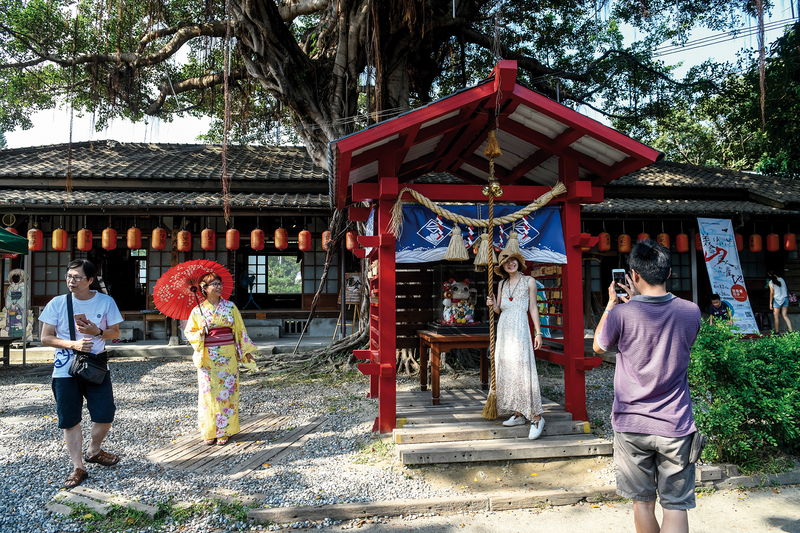 The Minsheng Community Development Association in Hualien carefully maintains the “General’s House,” and can provide yukata (light kimonos) for tourists to get a hands-on personal experience. 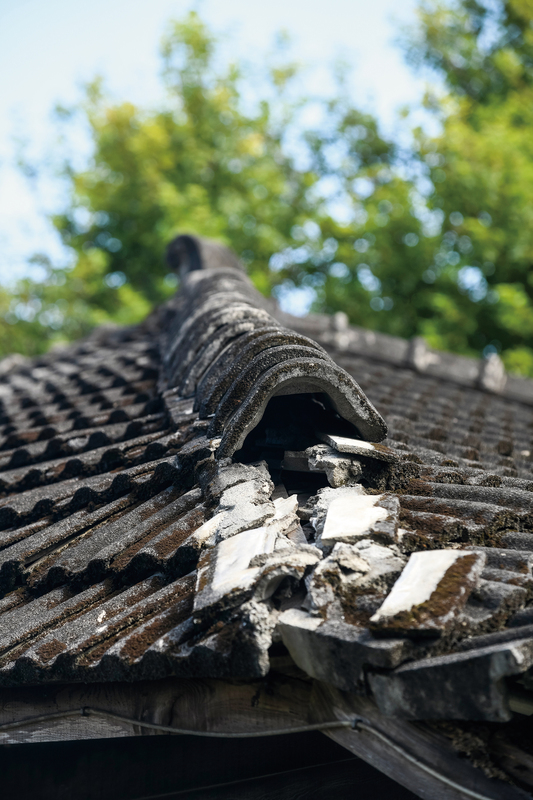 The broken roof tiles on the “General’s House,” which is a grade 3 county historic site, have a kind of battered beauty. In the future the house will be renovated as part of a Kyoto-style lane. Entering the garden of the Time 1939 bookstore is like returning to 1939, the year when the building was constructed. The environment of the Qingxiu Yuan temple is serene and secluded. It provides local residents with a place to calm their hearts and minds. 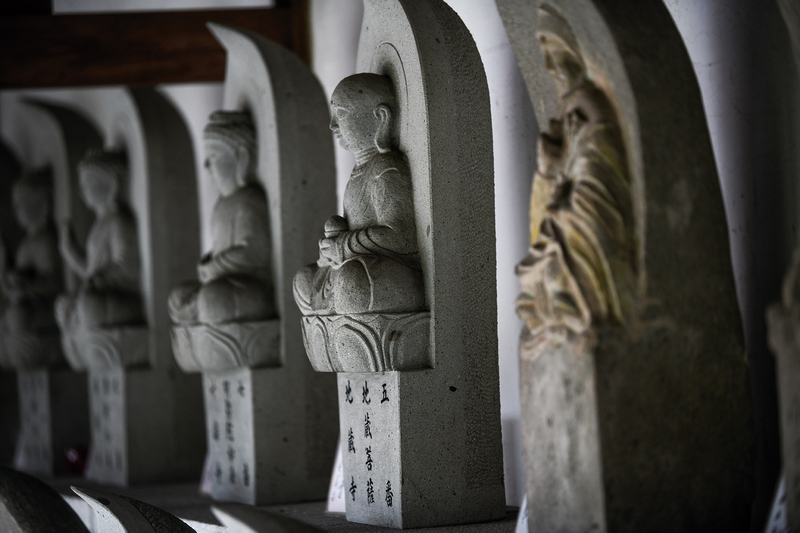 The 88 stone Buddhas in Qingxiu Yuan temple symbolize the homesickness felt by Japanese living in Taiwan. The roof of “5-Way House” is sloped on all four sides, just like the roofs often seen in Japan’s coastal belt. In Japan their purpose was to prevent the buildup of snow, but Japanese who migrated to Taiwan continued to follow their traditional regionall building habits when constructing new homes. 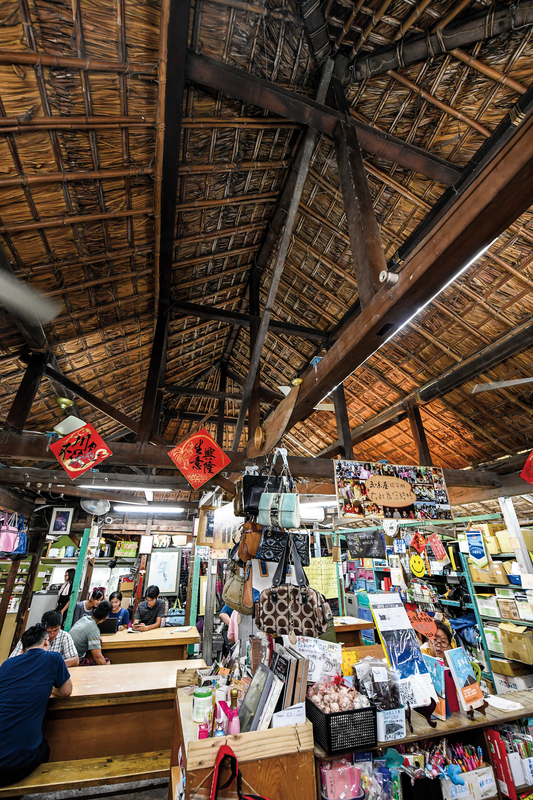 In the Hualien Tourism Sugar Factory, the former living quarters of the factory manager and the vice factory manager, which are in the midst of renovation, as well as the tourist accommodations, which now look like new, each have meaning symbolic of their times. “The wise love water, the benevolent love the mountains.” It just so happens that of the two main north‡south roads through Hualien County, one follows the coast while the other runs between two mountain ranges. This month, our occasional “Cycling Taiwan” series takes us to Provincial Highway 9, which passes between the Central and Coastal Ranges. 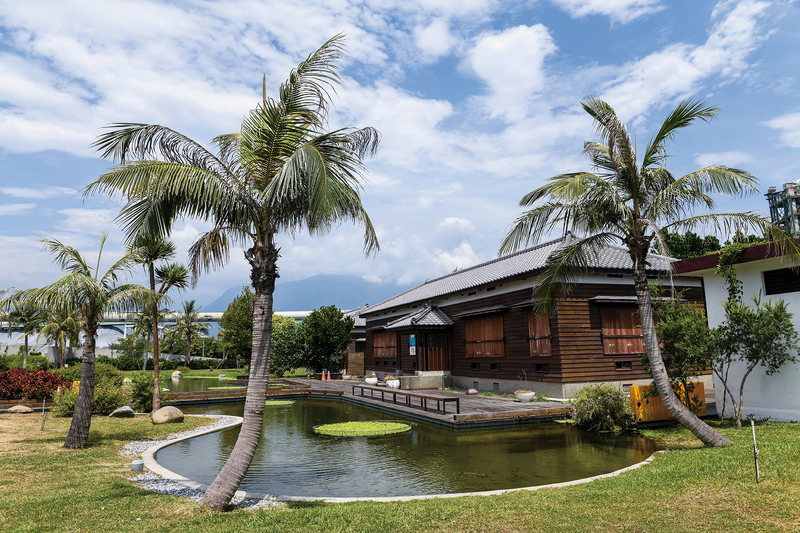 Just as the benevolent embrace all things, so has Hualien’s East Rift Valley embraced all manner of architectural styles over the last century. 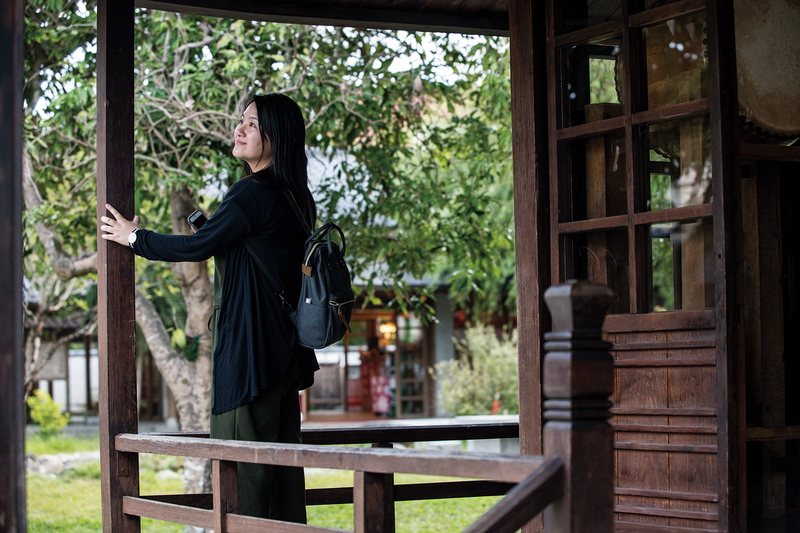 Trista Wu, owner of “Time 1939” bookstore, says: “I only started because I love this old house.” Our reason for getting on the road was just as simple: We love old Japanese­-style houses. 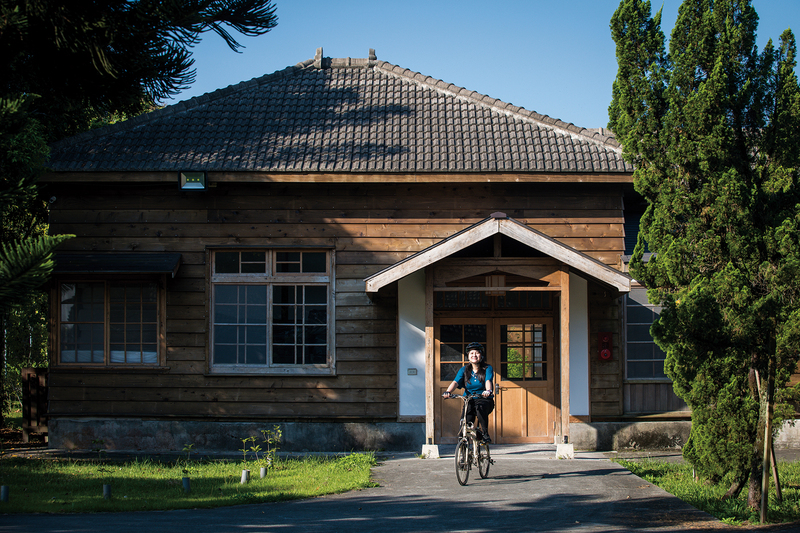 So come with us as we follow in the footsteps of Japanese immigrants of yester­year and ­cycle through Hua­lien, a paradise filled with Japanese style. We set out on our bikes from Qi­xing­tan Beach, and follow County Highway 193 around the Port of Hua­lien until we arrive at “D Park” (Taiwan Fertilizer Company’s Deep Ocean Water Industrial Park). In D Park there are two clusters of wooden structures from the era of Japanese colonial rule (1895-1945). Of these, the main office building has been renovated and turned into a theme restaurant. The institutional Shinto shrine, where Japanese workers worshipped in the past, remains standing outside the building, which is very rare. After eating, we continue southward along Highway 193 past the port until we enter downtown Hua­lien City, where in a street across from National Hua­lien Senior High School (NHSHS) we find the Kuo Tzu-chiu Music Culture Hall. The words of the song, though written after WWII, could just as well describe the fate of the Japanese who had migrated to Taiwan under colonial rule. Some went off to fight in WWII, while others returned to Japan, never to return, after the Japanese defeat. Each building they left behind carries historical memories. After NHSHS was founded in 1936, dormitories were built for its teachers according to the specifications for junior officials’ dormitories under regulations decreed by the Taiwan Governor-General’s Office, and included a Grade A residence that was built to the highest standard provided for. This building, which is no longer extant, was allocated to high-ranking military officers who were hired from Japan to come and teach in Taiwan. Naturally, one no longer sees teachers here wearing military uniform and bearing samurai swords. The weather-beaten teachers’ dorms have been restored, and one of them now serves as a cultural hall commemorating Kuo Tzu-chiu. The poet Chen Li described Kuo, who was his high-school music teacher, as “a legendary musician of Taiwan.” His works included “Memory,” “Your Coming,” and other standards for choirs. Kuo was born into a poor family and only graduated from elementary school. In 1946 he was hired to teach music at NHSHS, and worked hard to supplement his education, earning his junior and senior high school certificates and a junior college degree. Kuo’s motto was, “If you’re poor you have to improvise, and if you can improvise you can get through,” and he put this philosophy into practice in music education. He invented an electrically powered audiovisual device for teaching staff notation of music. He himself drew up the design, then asked an electrician to make a light board of the musical staff attached to an organ keyboard, so that when the note C was played on the organ, the position on the staff corresponding to C would light up. Combining the senses of hearing and vision, the device helped students to learn better. Having tapped on reproductions of an organ keyboard and an 80-year-old typewriter, we set off again on our journey, headed for the Mei­lun River. Along the Mei­lun River is a row of Japanese-style dormitories, with towering Chinese tallow trees shading the wooden buildings from the scorching sun. After they were built in 1928 as living quarters for military officers, one of the buildings, known as the “General’s House,” became the official residence of the highest-ranking Japanese officer in Hua­lien and Tai­tung, Colonel Mi­tsuo Naka­mura. Located in a pine grove at the foot of Mt. Mei­lun, it was his office and military command center. Our guide on this day, cultural volunteer Li Yong­zhen, is 90, the same age as the General’s House. Li explains, “The term ‘wan­sei’ referred to Japanese born in Taiwan under Japanese rule. I had one wan­sei classmate who joined the kamikaze force near the end of WWII, and never came back.” Six years ago, other wan­sei classmates came back to NHSHS from Japan to attend a school reunion. Everyone was saying to each other, “So you are still alive!” It was quite a moving scene. Beautiful afternoon sunshine falls at an angle on the moss-covered tiles of the old houses. After cycling nearly nine kilometers, it is time to let our bodies and minds relax. We enter the “Time 1939” bookstore, housed in a Japanese-era building, which offers a combination of vegetarian cuisine, second-hand books, and arts and cultural activities. “We feel very much at home here! It feels like we have been living here for 80 years,” says business owner Trista Wu. Perhaps it is the fragrance of Taiwan cypress that fills the room that causes people to forget the existence of time. In order to further experience the way of life of the wan­sei in days past, we next take Provincial Highway 9C to the Qing­xiu Yuan, a temple in Ji’an Township. The Qing­xiu Yuan is Taiwan’s best-preserved Japanese temple. Tradition has it that the 88 stone Buddhas that line the walls were brought to Taiwan from 88 different temples on Japan’s Shi­koku Island. Thus when believers circle the inside of the temple as they worship, it is as if they were making a pilgrimage to temples throughout Shi­koku. Continuing southward, our road becomes quite straight in Shou­feng Township, where east‡west and north‡south roads form a grid like a chessboard. This is the location of the foremost of the three large immigrant villages in Hua­lien that were planned by Japanese colonial officials: Feng­tian (To­yoda) Immigrant Village. 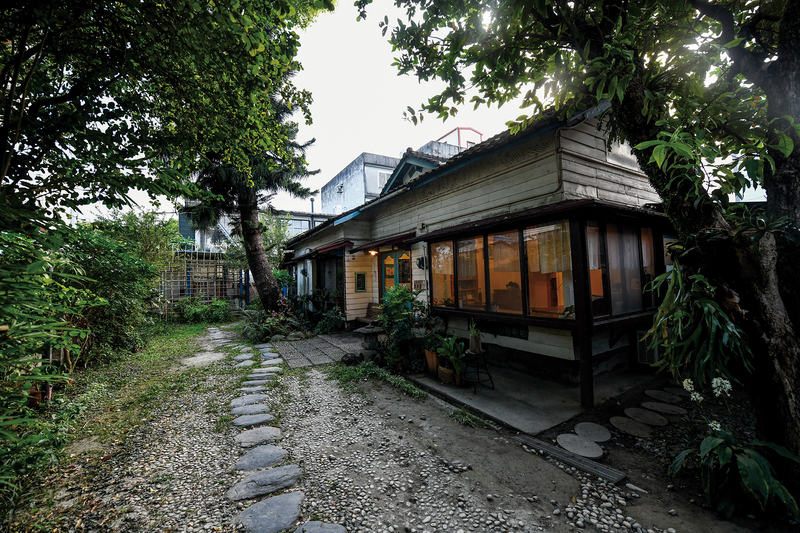 Outside the east side of Feng­tian Train Station is a wooden house that is now a second-hand shop called 5-Way House. The roof structure of the building is markedly different from the gable roofs that we have previously seen on the official dormitories. It is a hipped roof, sloped on all four sides. The roof’s ridge beam is especially short, causing the whole roof to resemble a pointed cone. The rafters are overlaid with a covering woven from Pacific island silvergrass (Miscanthus floridulus). The shop shelves, the wooden tables and chairs, and the children moving among them form a particularly engaging scene. Next we ride to the southernmost point in our nostalgic journey through Hualien, the Hualien Tourism Sugar Factory. The distance covered on our trip has already surpassed 59 kilo­meters. The black tiles on the sloping roofs are especially enchanting under the starry sky. Guided by old-fashioned streetlights and stone lanterns, we reach the place where we will stay tonight. Pulling open the sliding door, we are struck by the fragrance of Taiwan cypress and China fir wood. There is no need to consume alcohol, for the aroma of the cypress is intoxicating enough. On the outside there are slanting wooden buttresses, and inside there is a living area with short tables, traditional tatami rooms, and built-in cupboards, while the hallway, bathroom, and other areas have been restored in accordance with the original structure of the employees’ dormitories. This night, having taken a relaxing bath in a cypress tub, and dressed in yu­kata (light kimonos), we sleep exceptionally well on our tatamis, enjoying the omni­present fragrance of cypress. The Hua­lien Sugar Factory began refining sugar in 1921, and had many employees. The following year employees’ dormitories were built according to the Governor-General’s Office’s standards. 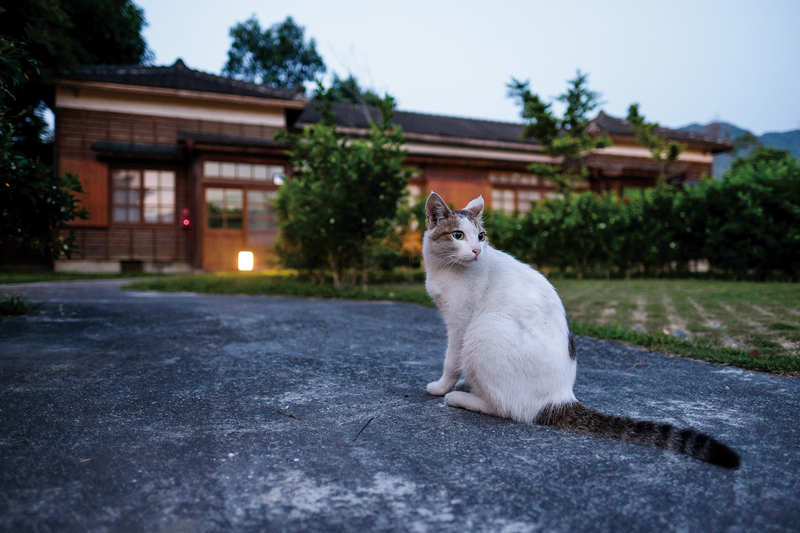 Today this is Taiwan’s one and only National Cultural Landscape where one can stay overnight. Vince Ou, assistant manager of the tourism factory, says: “The refinery had all kinds of basic facilities, from a canteen, primary school, and clinic, to a movie theater and barber.” The complete group of employee services buildings from the Japanese era has been preserved intact, so when you cycle around the factory grounds, it is just like being in the sugar refinery of 90 years ago. Following enthusiastic recommendations from numerous people at the sugar refinery, next morning we ride southward three or four kilometers from the refinery to roughly the 255 km mark of Provincial Highway 9, where we turn left and see a ruler­-straight road heading toward the horizon. This road leads into Da­nong­dafu Forest Park. This manmade forest park, which covers 1,250 hectares of the rift valley plain, is planted with nearly 20 species of trees. 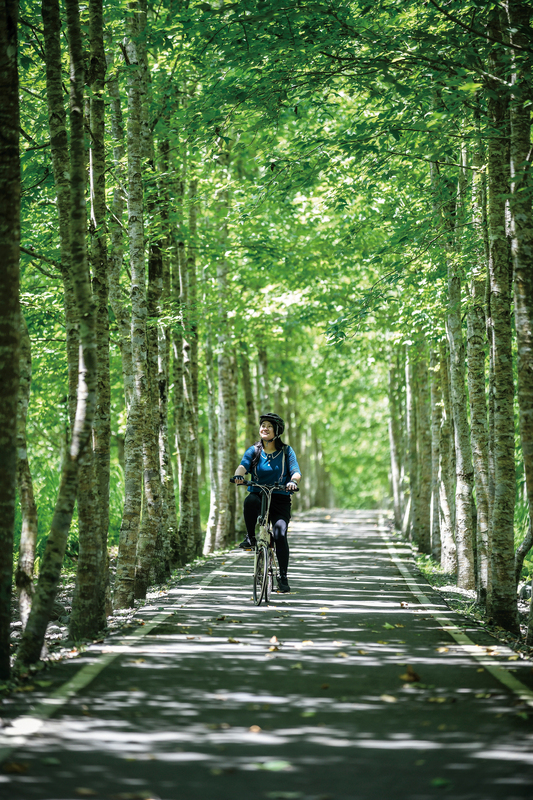 Senior guide Yang Meng­yao takes us on a ride around the northern circuit of the park’s bike trail, where we are surrounded by Formosan sweetgum, Oliver’s maple and woodland elaeo­carpus trees. The park has a rich ecology, offering the chance to encounter ferret-badger, masked palm civet, and wild boar during a ride. If you visit at night in March or April, you can also admire the fireflies along the northern circuit of the trail. Without Yang’s guidance, we would never have discovered that the Oliver’s maple leaves here carry a hint of the sweet fragrance of passionfruit. Surrounding the bicycle trail are flamegold rain trees where ants build nests, enabling us to observe the symbiotic relationship between the ants and the trees. 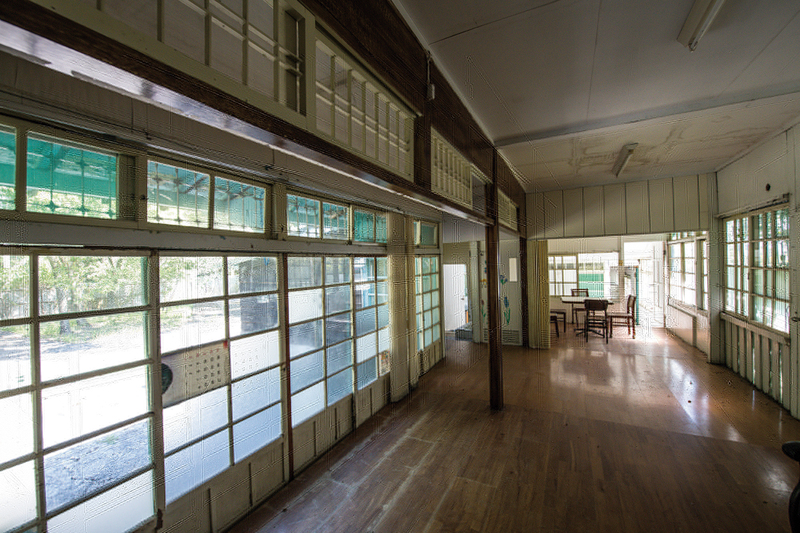 The immigrants and wan­sei who lived in the East Rift Valley in the Japanese colonial era left behind not only buildings, but also an endless fount of stories and a spirit of fortitude. Riding through Hua­lien, I too am just a visitor passing hurriedly through. I got on my bike out of a love for these old houses, and passed by the footprints left behind by Japanese immigrants and wan­sei, and the traces of the sugar-cane plantations that once occupied the land of today’s forest park. These layered imprints in my mind have been woven into this record of a nostalgic journey.